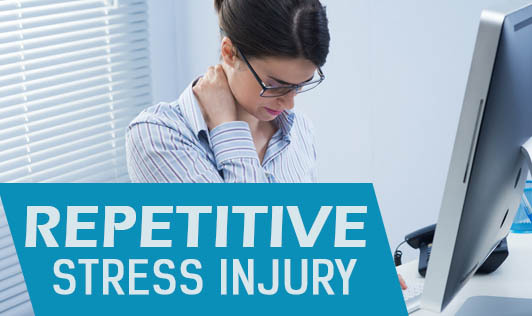 Repetitive Stress Injury (RSI) is an injury that happens when too much stress is placed on any part of the body, resulting in inflammation (pain and swelling), muscle strain, or tissue damage. This stress generally occurs from repeating the same movements over and over again. RSIs are commonly work-related injuries, often affecting people who spend a lot of time using computer keyboards. While most common in adults, RSIs are becoming more prevalent in teens because they spend more time than ever using computers that involve repetitive motions leading to RSI. Teenagers who spend a lot of time playing musical instruments or video games are also at risk for RSI. In general, RSIs include more than 100 different kinds of injuries and illnesses resulting from repetitive wear and tear. These injuries vary from person to person in type and severity. Nutritional factors also come into play in RSI. Proper nutrition is essential for developing and maintaining strong muscles and bones - and to keep up the energy levels needed to play sports and perform other physical activities well. If you notice any of these warning signs of RSI, make an appointment to see a doctor. Even if your symptoms seem to come and go, don't ignore them or they may lead to more serious problems. Without treatment, RSIs can become more severe and prevent you from doing simple everyday tasks and participating in sports, music, and other favorite activities. Prevention is the best medicine when it comes to RSI. Overall flexibility and strength can help to prevent RSI, so exercise regularly and stay active. To avoid overusing muscles and joints, be sensible about the amount of time you spend doing any repeated motions. If an activity is repetitive, take breaks and do something different every 30 minutes or so. If you are diagnosed with an RSI, resting the affected area is the key to getting better. You may be recommended to take anti-inflammatory medication for a period of time. Ice packs are sometimes recommended to reduce pain and swelling. After the swelling and pain have gone away, a rehabilitation program with a physical therapist to exercise your muscles and prevent loss of joint movement would be recommended.